2019 is set to be a remodeler and home decorator’s dream year. Regardless your style, trends are showing that 2019 will include a number of unique looks that are sure to please even the most discerning eye. Let’s take a look at some trends we can expect to see in 2019, and maybe make some predictions while we’re at it. 1. Two-tone Cabinets – This is an emerging trend that grew some legs in 2018. There’s no sign of stopping this eye pleasing design feature in 2019. Whether dark and light or custom offsetting colors, the two tone look enables people to truly personalize their favorite space. Some designs show islands in separate colors from the other cabinetry. Others show upper and lower cabinets with different finishes. Either way, watch for two-tone to continue into a two year run. 2. Naked Cabinets – Look for millennial influence to take hold in 2019. Open-face (cabinetry with no doors) or naked cabinetry has started becoming very popular and It’s our prediction that trend will only grow in 2019. 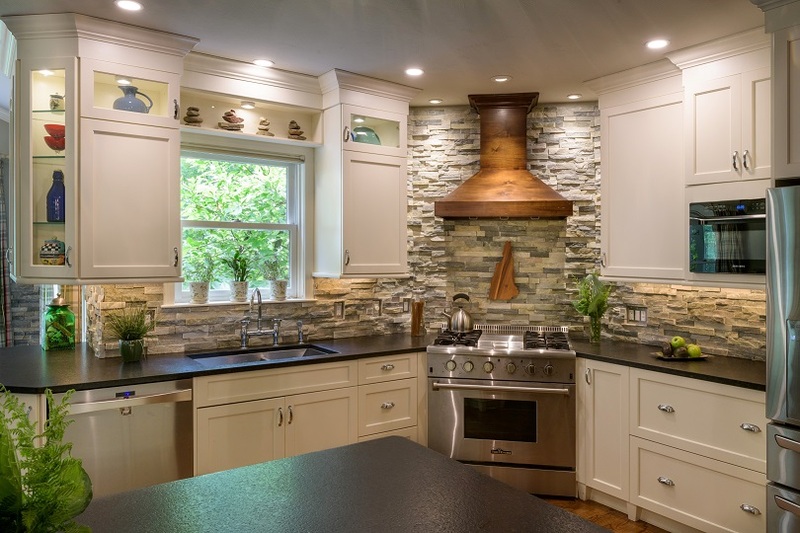 There are two big reasons for the naked cabinetry look becoming hot. It allows for easy access to dishes and other stored items while offering a way to visually see inventory and showcase designer dishes. It also saves cost. One of the primary drivers for cabinetry prices is the doors. Removing this element allows more money to be spend on other high end finishes, like quarts or granite counter tops. 3. Textures and Materials – Product developments at many companies like StarMark Cabinetry have opened the door on unique, textured finishes. Are you looking for a clean, modern or transitional look? Consider a melamine finish, laminate, or glazes. Unique levels of sheen, distressing, and other high touch features are offering even more ways to customize your kitchen and bathroom. 4. Hidden features – Look for 2019 to be a year for subtle design features that make kitchens both fun and functional. Touch to open drawers offer a clean look without handles and extra hardware. Pull outs, roll-trays, and factory included drawer organization will all become staples in the 2019 kitchen. Toe-kick drawers hide large pans out of sight. Appliance garages offer a cool way to conceal larger countertop appliances like toasters and coffee-makers. Sometimes what you don’t see is where all the magic happens. 5. Frameless/Full-Access – European style is sweeping the States and 2019 will continue the spread of this popular design. Offering more storage space than framed lines and clean looks are a couple of the factors leading many homeowners to consider this style. 6. Walnut – Once reserved only for furniture, many cabinet manufacturers like Fieldstone Cabinetry have perfected the use of Walnut for cabinets. This rich wood species offers a very distinct look in the kitchen and is very durable. Think of it like furniture for your kitchen. Few species offer as rich a look as Walnut and many discerning buyers are looking to it to help them make a statement with their new kitchens. 7. Mixed Metals – Historically this was considered faux pas; however, many creative homeowners are looking at mixed metals to help their kitchen stand out from their friends and neighbors. Stainless and brass? It happens. Gold and brass together? You’d be surprised. Chrome and other mirror finishes with solid black. Yep, that too. There are no more boundaries when it comes to mixing metals and finishes. 8. Custom Colors – It’s no secret there are an almost endless supply of stock colors from many cabinet manufacturers these days. However, sometimes we need something that no one else has. Something reserved just for ourselves. Want to show off cabinets that no one else can say they have? The custom color program at many manufacturers is easier than ever. Bring in a shirt, a picture, anything with color and chances are high a custom cabinet manufacturer like UltraCraft Cabinetry can match it. 9. High tech – Look for appliances and lights to incorporate voice controls through smart home devices. Vacuum drawers and charging stations for electronic devices will bring new functionality to the typical storage areas. Look also for a modern spin on retro appliances as a continuing trend. These trends are setting up 2019 to be a year of fun and functionality for home renovations. What would you add to this list?